Aranmula metal mirror is a rare piece of craft that had existed even during the Vedic period of Indian history. The myth about the origin and secret of its composition makes it a truly fascinating craft. As traditional as the mirror-making technology is, the artisans’ belief that the composition of the metal mirror is divine and some undisclosed metals alloyed with silver, bronze, copper and tin are responsible for the distortion-free images. Approximately five generations ago, a few Indian artisans came to Aranmula from Sankaran Koil near Tirunelveli. They came at the behest of the King of Pandalam, who asked them to participate in building the Aranmula Parthasarathy Temple. These artisans, aside from carrying out their assigned tasks, made ornaments (e.g. bangles and rings), cooking vessels and bells by casting copper based alloys. In working with the bronzes, the artisans discovered the reflective property of one particular copper-tin alloy. 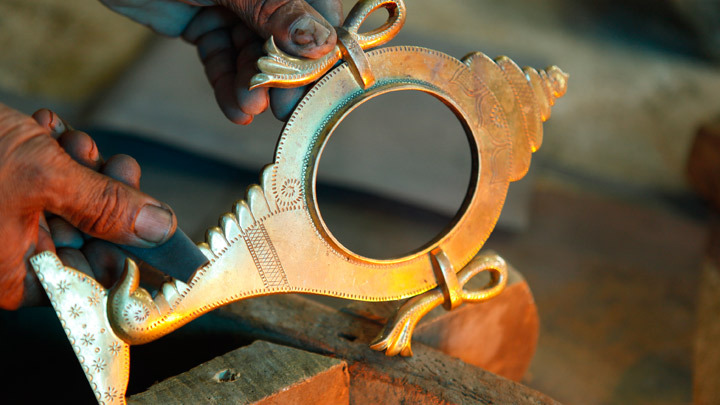 This characteristic of the polished metal has been exploited for making those bronze mirrors known as “Aranmula Kannadi”, meaning Aranmula Mirror. 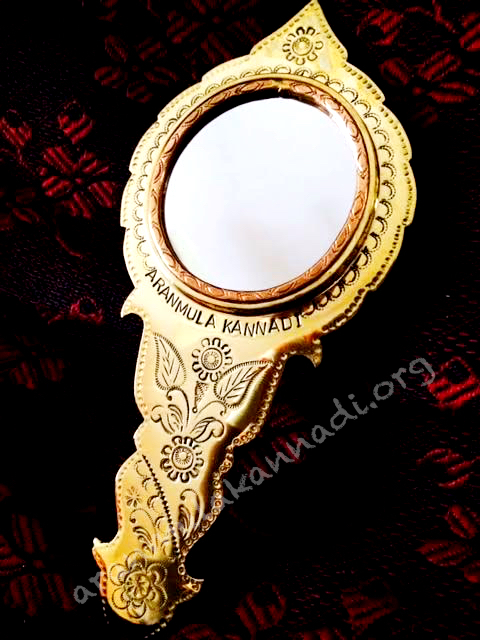 Aranmula Kannadi (Aranmula Mirror) is a precious inherited gift. The mystery of its production is a family gift handed over through generations. It is an exclusive product of Aranmula, near Chengannur, a village in Pathanamthitta District, Kerala State, India. This artistic creation is to adorn the grandeur of the houses. This handicraft is as beautiful and attractive as the glittering gold purified. In Puranas it has been described as the mirror of Goddess Parvathi. It is luxurious thing used to decorate and beautify the celebrations and ceremonies. It is famous for its secretive construction method and uniqueness in the make which get Patent protected with a Geographical Indication tag. A few centuries back the high priest of Aranmula Parthasarathy temple found that the crown made for the deity was cracked. The local king then summoned the head the bronze smith clan and ordered him to make a new crown within three days. The chief got worried as he did not have sufficient materials. Further there was not sufficient time to get the material from other places. He came home and told his wife about his worries. It is claimed that while they were sleeping, the Goddess appeared in he dreams and told her the proportions for a bronze alloy that shone like a mirror and asked her to tell the ladies of the community to surrender their gold ornaments. All the gold were collected and sold to buy sufficient tin and copper. That night she went and told all the ladies to do as per the orders of the Devi. The crown made out of the combination of copper and tin turned out to be a marvel of art and craft. It was silver like colour, brittle like glass, shone with rare brilliance, and when cleaned acquired the quality of reflection. The makudam of crown known as Kannadi Bhimbom (Mirror image) was preserved in the Aranmula temple till 1946. The casters soon worked out the ratios of different metals used. The chieftain of Aranmula liberally patronized the craft persons and even laid down an order that the mirror should from one of the eight auspicious articles used in all Hindu religious rites including marriage. They then made a small “KUMKUMA CHEPPU” or vermilion container, in bronze and filled in with a small bronze mirror on the cover. This became very popular among the elite of Malayali Society. Under the patronage of a few aristocratic ladies the VaalKannadi flourished. But the demand died gradually a cheaper glass mirrors were available. The popularity of the handicraft grew by bounds only a decade ago, stepping us its demand especially in foreign countries.